the Movement for the Sovereign State of Biafra (MASSOB), Chief Ralph Uwazuruike, as Biafran International Passport. 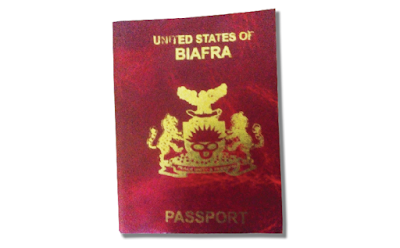 It is alleged that MASSOB generated over N500 million from the sale of the passport alone. But incidentally, it was a passport to nowhere, as none of those who obtained it could travel with it. Findings by New Telegraph indicate disenchantment and disappointment among former loyalists of Uwazuruike who bought the Biafran passport. A holder of the passport, Ngwoke Ibem Ngwoke, who has since dumped Uwazuruike, told New Telegraph that whatever led people to rush to buy the passport can best be described as mass deception’, skillfully deployed by an unscrupulous spin doctor. He said: “I paid N10,000 to buy the passport. At the time, I was the Administrative Secretary. Members and interested persons paid the sum of N10,000 into a designated bank account at First Bank, then presented the teller to me. I verified and issued receipt and they in turn took the receipt to the passport officer, who was delegated by Uwazuruike, one Ambrose Anyasoh, who will see the receipt and then issue the passport. “Based on the assurances given to us by Uwazuruike, which we didn’t know were all lies and make-believe, we even urged people to buy and use the passport for ease of travel. “Uwazuruike told us that he was set to travel with the Biafran passport, assuring us that there was no hindrance or security encumbrances travelling with the Biafran passport. One of our aged members bought Uwazuruike’s story like many of us did at the time and convinced his daughter who was about travelling to Europe to use the passport. The lady was arrested in Lagos and was detained for nearly two years. Uwazuruike did nothing to free her,” Ibem said. He maintained that today, four of Uwazuruike’s children and wife are overseas and none of them travelled with the Biafran passport. Ngwoke stated that the issue of Biafran International Passport was not the only initiative of Uwazuruike to allegedly exploit the largely impoverished membership of MASSOB. He recalled the launching of a MASSOB plate number. He said: “Speaking about the area I operated and know very well, many people in the Nsukka area of Enugu State were clamped down in detention for several months for buying and using the MASSOB number plate as recommended by Chief Ralph Uwazuruike. And there was never a compensation or refund for damages caused the buyers.” Another respondent, who spoke to New Telegraph and wanted to be addressed simply as ‘Chief’ explained that the Biafran International Passport was apparently printed in Lagos and brought down to the South-East by one Benjamin Onuegbu (a.k.a Papa) who also prints the Biafran income tax receipt and coordinates Western operations of the group at the time. “I bought the Biafran International Passport around 2012. I paid to Anyasoh who was mandated by Chief Uwazuruike to handle the passport issuance. Chief, however, noted that his biggest regret in the course of the passport saga came when he recommended the passport to one of his friends, who was about travelling to Canada, but was facing some minor bureaucratic delays. Chief maintained that he paid for the passport at Okwe in Uwazuruike’s country home. “When the sales of the passport started, we were paying cash, but later a bank account was opened and run by Anyasoh. But the withdrawal book was kept by Uwazuruike who superintended over the account,” he said. The issuance of Biafran international passport by the then leadership of MASSOB under Uwazuruike has, for some time now, remained a talking point among public commentators. This followed revelations made by the splinter MASSOB group under the leadership of Comrade Uchenna Madu, while announcing the findings of a probe of the leadership of the group under Uwazuruike. “Under Uwazuruike, each member also paid N10,000 for Biafra International Passport to Ralph Uwazuruike. Since 1999 to 2014, members have contributed about N300 million to Uwazuruike’s account while about N200 million was also paid into a Zenith Bank account of Confidence Uwazuruike, a son of the former leader,” Madu said. Reading the communiqué at the MASSOB National Headquarters, Okwe in Onuimo council area of Imo State, the group maintained that Uwazuruike’s introduction of the Biafra International Passport without the existence of a sovereign state of Biafra was a grossly dubious and fraudulent means of amassing over N100 million to himself. “Many, who attempted to use the passport landed in trouble. Today, the passport is useless to thousands of its holders as not even Uwazuruike uses it. This was a premeditated scam,” the communiqué read. Madu told New Telegraph that the Biafran passport is a scam.